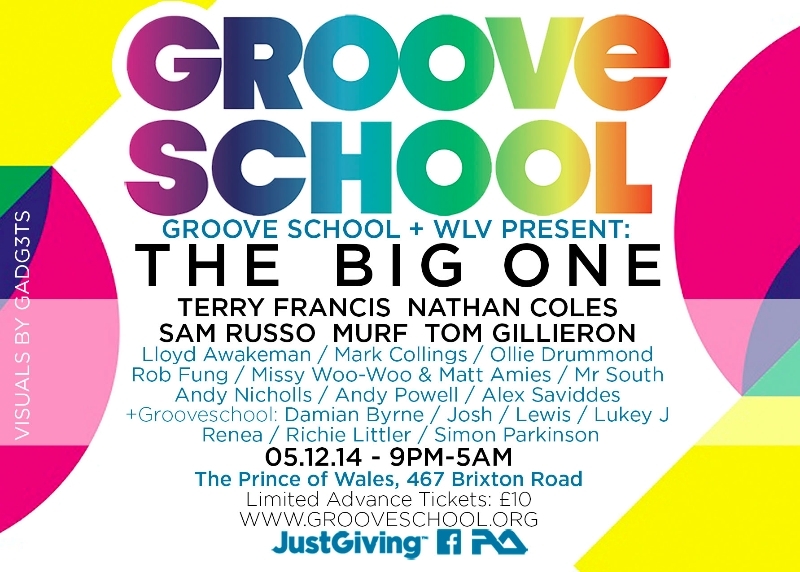 On Friday 5th December 2014, Grooveschool and We Love Vinyl collaborate to bring you their main fundraiser of the year “The Big One” at the Prince of Wales venue in Brixton. Expanding their existing Friday night involvement at the Prince Of Wales Brixton Boogaloo, they now take over all three rooms especially for this event. Many established DJs are investing their valuable time to concentrate solely on raising charitable funds on the 5th December. All of the ticket sales and donations from the evening will go directly towards the various community projects for young people provided by Grooveschool. The night will feature Terry Francis (Fabric), Murf (The End), Nathan Coles (Wiggle), Tom Gillieron (RvS Music) and Sam Russo (Fabric). The younger participants of Grooveschool, fresh from their recent invitation day sessions at Fabric, will also have the opportunity to play earlier on in the evening, supported by their family and friends. This special night also sees one of the rooms hosted by the cool cats from We Love Vinyl (WLV). With DJs including Andy Nicholls, Rob Fung (WLV), Andy P (Funkd Up) and Lloyd Awakeman (Slide and Get Diverted). For the last three and half years, Grooveschool have hosted a series of free DJ and Music Technology sessions, for local young people in South London. Practitioners voluntarily giving their time and contributing advice and skills. The essence of the workshops is to teach children how to compile a DJ set which includes their own works, be it sounds, loops or tracks. Grooveschool provide opportunities for each young person to play at live events and on radio shows, allowing them the chance to get involved and shape Grooveschool of the future. There is an emphasis on participants becoming tutors, as well as an active policy of bridging age and social environment gaps. Since 2011 Grooveschool have run and hosted free DJ and Music Technology Workshops for young people across London. Grooveschool is based at The Stables Workshop Space, which is part of the London home of the charity Music4Children. The workshops involve playing and listening to records and learning DJ skills. Using record decks, DJ mixers and computers, the children learn how to set-up the equipment safely, cue, fade, place a mix and compile a set. They also learn how to beat match, use EQ and add Fx, and are given an introduction to scratching. With the incorporation of multi-media programs and midi controllers, the pupils record and create sounds; loops, tracks and mixes. These workshops aim to generate momentum and energy, ideas and creativity through music. The free programmes encourage young people from poorer backgrounds to get involved, and all children gain and build confidence, self awareness and worth. A further aim of Grooveschool is to train potential advisers/tutors to become a sustainable project for communities. 2010 Richie Littler (formerly of Swag Records) does his first DJ workshops at local schools. 2012 Simon and Richie take part in Music4Childrens successful World’s Highest Gig attempt http://bit.ly/1oWwBpY playing at an altitude of 6,500 metres on Mera Peak in the Himalayas (see attached image). Raising enough funds so that the build of the charity’s orphanage in Dhulikel just outside of Kathmandu could be completed. Lambeth Youth Mayors Award Winners 2012. A successful application and presentation by Grooveschool participants. Grooveschool Fundraisers continue with bank holiday all-dayers. 2013 Grooveschool acquires accreditation, AQA Awards and Arts Awards in place for participants to attain. Grooveschool's Summer Groove Course take place. Grooveschool feature at Crystal Palace Festival 2014. Streatham Stables Community Centre, a Music4Children Project with Grooveschool at the helm, is completed and opened. Series of Grooveschool fundraisers at Prince of Wales in Brixton begin.